Pepsi's Superbowl offer is back! 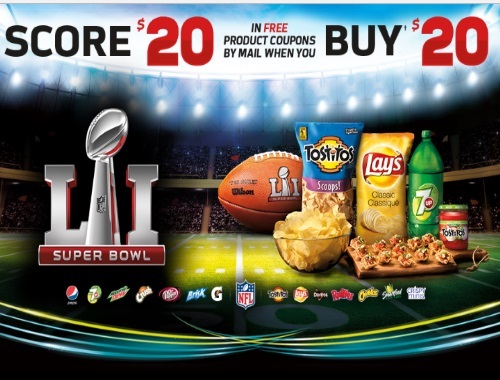 When you buy $20 worth of PepsiCo products you can get a $20 rebate offer! When you purchase any combination of products totalling $20 at participating retailers you can get a $20 Free Product Coupon booklet via mail. Participating products (any size/variety/flavour): Lay’s, Doritos, Tostitos, Ruffles, Munchies Snack Mix, Smartfood, Rold Gold, Cheetos, Chester’s, Crispy Minis snacks; Tostitos or Ruffles salsa/dips; Pepsi, 7UP, Mountain Dew, Mug, Schweppes, Crush, Dr Pepper soft drinks, Brisk beverages, Gatorade and G2 products. Please note, products must be purchased between January 1 - February 14, 2017 in the same transaction and receipts must be uploaded by February 17, 2017. To submit your rebate, take a clear picture showing the full receipt of your purchase. Upload it and complete the rebate form. Allow 4-6 weeks after the end of the promotion to receive your booklet.